Mike Peters Snowdon Rocks 2015 | News by Wales Express News, People Before Profit! Cancer patients and their carers from across North Wales will have the opportunity to enjoy this summer’s ‘Snowdon Rocks’ festival atop Mount Snowdon, thanks to the generosity of local Rotary Clubs. A specially commissioned Snowdon Mountain Railway ‘Strength Train’, which is being sponsored by Holyhead Rotary Club with the support of other Rotary Clubs in North West Wales, will take around 70 local people living with cancer and healthcare staff to the mountain’s summit, where they will enjoy a festival of music, thanks and remembrance. 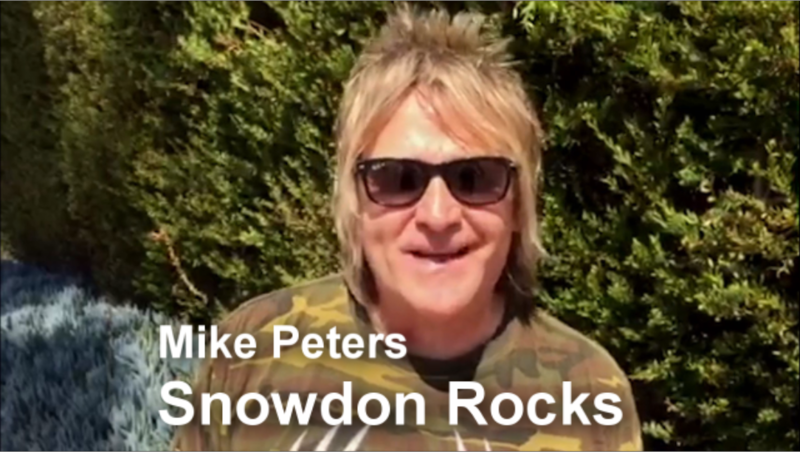 Snowdon Rocks, the annual event set up by Welsh rocker and two times cancer survivor, Mike Peters, is now into its ninth year. The event on June 20, will see hundreds of revellers summit the 1085 metre mountain while enjoying intimate performances along the way from the Alarm front man. The one day festival will also feature presentations by local music groups at Electric Mountain and a ‘Snowdon Rocks’ after party at The Heights, Llanberis. Since being established Snowdon Rocks has raised over £300,000 to support people with cancer in North Wales. “Both Mike and I were keen to ensure that local people with cancer, who wouldn’t otherwise be able to take part, had an opportunity to participate in this wonderful occasion,” explained John Chamberlain from the Holyhead Rotary Club. “I’m leading the By Your Side appeal because I want to give back to the healthcare and support staff who have been by my side, and continue to be by my side, throughout my journey with cancer,” explained Peters. “I’m thrilled that this year many more people living with cancer will be able to enjoy this brilliant day thanks to the generosity of our friends in Rotary Clubs across North West Wales. This year’s event will feature a ‘Memory Chain’ of flags with messages from people who want to remember loved ones, share memories, give hope and offer thanks to those involved in cancer care in North Wales. For a suggested donation of £5, your personal note will be inscribed on a prayer flag and linked with others. Snowdon Rocks is open to people of all ages and abilities. Those interested in taking part can register here (link). For more information about the Strength Train (free of charge, tickets are available on a first come, first served basis) and the Memory Chain, please call Patrick from Awyr Las on 01248 384395 or go to www.byyoursideappeal.org .